A slice of Dulce de Leche Loaf Cake. I’m late! I’m late! For a very important date!!! Two days late for my 52 Cakes date! I have been preoccupied with apartment hunting and catching up with old friends and then finding the time and ingredients to bake a cake while on vacation proved a little more challenging than I had expected. My inspiration for this cake was the Dulce de Leche that my host and BFF always keeps in her refrigerator–made by simmering a can of sweetened condensed milk and then enjoyed by the spoonful as a special treat, she calls it Candy. Remniscent of a gooey caramel sauce, it would be great served with ice cream or on banana fritters. My Dulce de Leche Loaf Cake did not turn out perfectly. It has a pleasant flavour (not instantly recognizable as Dulce de Leche) and is almost as dense and moist as a pound cake. So while I’m not planning on making it again, I’m not hearing any complaints about it either and I thought it was great paired with a hot tea. I think the bundt cake version from Ambrosia Baking looks much better and her filling of Dulce de Leche stayed intact while mine dispersed throughout the cake while baking. Check out the link above for the recipe. As you can see from the pictures, I had some trouble with the baking time. The top of the cake was well-done way before the bottom was and even after I waited until the toothpick came out clean, the bottom of the cake was underdone. With two flop weeks in a row, we are due for a successful cake for Easter week! 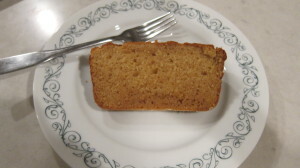 The bottom of the loaf cake was underdone after cooking for 45 minutes. You can see the underdone part of the cake at the bottom of the slice and loaf. Still edible though! Do you have plans for a big Easter dinner? I’m still looking for a good vegetable dish to take to the family dinner here. Something that can be easily transported and can be served at room temperature would be perfect. Any suggestions?